Second chance at forever. ..Book Review. 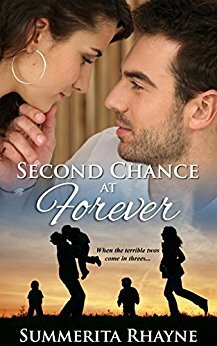 Book: Second chance at forever. ‘Second chance at forever’, brought back memories from almost two decades ago – college days, when I devoured romances hungrily! Times, when the whole idea of a tall, dark, handsome knight riding on a white horse and sweeping me off my feet made me all giddy and dreamy-eyed. Something similar, but a tad bit more sensible came to mind as I read this book. The age range of the characters and my own awareness about the realities of life made the difference! ‘Second chance at forever’ is a love story of a different kind. Stuti, the heroine, is a widow with 2 year old triplets and an old mother-in-law to care for. She is a working woman, fighting a battle of bringing up her children singlehandedly, with some help from an understanding and a supportive mother-in-law. On vacation to Rajasthan, she runs into Revath, her old boyfriend, who is now a fashion photographer – a man Stuti had parted ways with almost 6 years ago. A man, who chose to live a free life than be tied down to a commitment. It is a story of the passion that is rekindled all over again. Of emotions that come a-knocking at the doorway to their hearts as memories from the past and realities of the present make them wonder if they can dream of a future they would otherwise never have had. The intensity of their passion hasn’t ebbed with time. However, now, there are Stuti’s triplets and their future to be considered. Ironically, dealing with children is not a strongpoint Revath can boast of and which is a constant source of worry for Stuti. The ups and downs the two go through as they come close to each other and grow distant all at once is what the story is all about. The romance between Revath and Stuti warmed the cockles of my heart, as did the heart-touching innocence of the three little angels. The fervent hope that the two characters put away their differences and begin a new life kept me going. The story does feel too long-drawn in places, but then that’s how romances have always been! Full of raw emotions and loads of romance that is quite absent in real life, there’s a reason we turn to these books to enjoy some of it vicariously, isn’t it? It is a fine book to pass long and empty hours; a story with suspense that makes us question if true love and happily-ever afters exist in our world. A story about the travails of a single mother and the balancing act she has to manage in order to earn a decent living and bring up her babies. It’s a good read if you are looking for some change of scene from your regular suspense thrillers or sci-fi dramas. A healthy heart in a healthy body. How I wish I could turn back the clock! Sounds like an interesting read. Hope to pick it up soon. Thanks for this review !!! Hope I may find time to read it sooner than late. I love escaping with a good romance, too, Shilpa. This sounds like a good one. If only reality could be all dreamy and romantic like these novels. Sigh. I like the premise of her being a single mom with triplets. I like stories where the woman is tough and strong and not just waiting for the man to solve all her problems. I'm sure that adds lots of conflict when her boyfriend doesn't like kids. Yes, they are never true to life but that's why we like them, right? That's a nice read. A mature love story. Thank you for the recommendation. Shall note down the title. It sure is scary; a risk, if I may say so, Roshan! I am glad you liked the review, Vasantha! Yes, Cat! I, too, wish romances were for real. Sigh. Yes, Ls. A mature love story, for readers of a particular age.